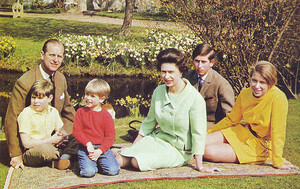 Queen elizabeth ii with family. . Wallpaper and background images in the Ratu Elizabeth II club tagged: queen elizabeth ii prince philip prince charles. This Ratu Elizabeth II photo might contain jalan, tempat kejadian bandar, tetapan bandar, menetapkan, bandar tempat kejadian jalan perbandaran, bandar, oak hidup, and live oak.